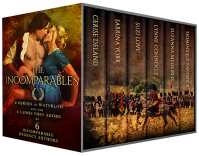 The Incomparables limited edition box set includes 6 scorching romances that commemorate the 200th anniversary of the June 18, 1815 Battle of Waterloo. Award winning historical romance authors Cerise DeLand, Sabrina York, Suzi Love, Lynne Connolly, Suzanna Medeiros and Dominique Eastwick. When Lady Melton and her son, Daniel, are forced to join antagonistic Captain Belling and the last group of wounded soldiers evacuating from Waterloo to London, she expects clashes with army deserters, both French and British. What she doesn’t anticipate is falling in love with the Captain, nor how much their lives will change. Captain Roarke Wooldridge is about to find out that sometimes love does heal all wounds. But when his need for revenge collides with desires he never believed he would feel again, will he be able to put aside the scars of Waterloo to embrace his future? and ARe for 5+ weeks! 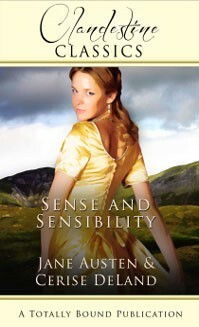 Top 20 Regency Bestseller for 6 months! that Challenge the Family Curse! Jack, Adam, Wes and Mark Stanhope fear falling in love. No wonder. 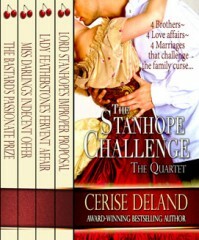 No Stanhope has enjoyed a happy marriage in centuries. What does it take to change the family curse? Courage? Devotion? Love? Adam Stanhope is a politician who needs a wife. When he marries for convenience, he overlooks the fact that he cares for his lovely childhood friend more than he should. Wes Stanhope is a national hero, but he’s wounded physically and emotionally. When the woman he loves wants to help him, he learns that the woman he adores can be just as courageous in the bedroom as he was on the battlefield. Jack Stanhope leads a carefree existence but when he meets Emma Darling, he realizes that in saving this woman from dastardly men is his saving grace. Illegitimate Mark Stanhope expects nothing from his family, but when they save him, he in turn saves a young noblewoman who has the valor to stand against others who would abuse her. Lady Solange Starling has a special skill. But catching spies within her cousin’s embassy has never presented a challenge…until now. 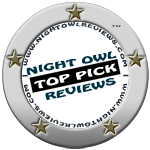 One moonlit evening in a garden, Solange views a daring man she has not seen in years. A man she never forgot. A man, who even in his youth, carved his place in her life and her reverie. Monsieur Noir, he calls himself. And so he is, a man living in shadows, dark and dangerous to her heart. As the two of them join together to weed out the nemesis who attempts to destroy their fight against Napoleon, Solange and Noir learn how rich grand passion can be. Once more, they fight against cruel fate to give them what they most desire. Each other. Free of torment and loss. Free at last to love.